During dinner, enjoy the smooth sounds of Tabitha, accompanied on guitar by Russell Padmore from 8pm. After dinner, enjoy DJ music on deck from 10pm. 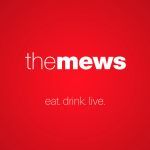 The Mews is a small restaurant with a enviable reputation for fine food. Located in up-market 2nd Street Holetown, it serves international, seafood and Asian dishes.